So what is depression anyway? Depression is excessive sadness. Most people realize that. A lot of people don’t realize it is also a lack of love and joy. All of us have moments of feeling abandoned, betrayed, rejected. However, if your sadness stays on for a long time, you have got an emotional problem that ends up becoming physical. What causes the emotional pain of sadness, frustration, depression? Sometimes you feel that you have lost someone for ever. Sometimes you feel worthless, disrespected, or unloved. Or, you have been treated unfairly. You will get irritated, thinking things should be different. This grumpiness, loneliness, and irritability are all flavors of sadness. And then your body feels it. You get tired. You move slowly. You find yourself slamming doors or swearing at people. Small things make you snap and you story criticizing yourself. You look in the mirror and say, “I don't like myself.” You can’t figure out if you are sad or angry. It is difficult to know where the sadness ends, the irritability begins, and the anger erupts. So how do we look at depression? Our feelings are an intuitive part of our well-being, letting us know that some need is not being met. When we feel sad or angry, it can overwhelm us, take over our lives, and make our relationships a battlefield. We may abuse ourselves with food (binge eating), drinking, bad relationships. 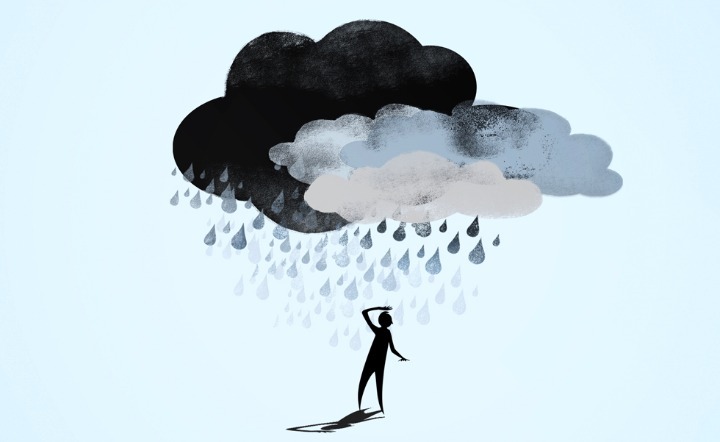 Often when we are in a bad mood, we feel that we are not good enough because depression, anger, and irritability are not just about being in a bad mood. They are about not having enough love and joy. Note: Keep in mind that good emotional and physical health begins with loving yourself! Sadness and anger are part of your emotional guidance system, which tells you rat something needs to change. Emotions themselves aren’t the problem. Sadness and anger are often seen as negative because they don’t feel good. However, difficult emotions like sadness and anger are a fire alarm prompting you to stop and think about what is wrong in your life. So how does a negative emotion like sadness or anger get transformed into symptoms in your body? Mood becomes a medical a medical problem via a domino effect of chemicals. First: something make you angry or sad. Whatever it is, you simply cannot snap out of it. Those emotions of anger and sadness move down from your right brain, that area for pure emotions, to your hypothalamus (the area in the brain that regulates your hormones, for eating and sleeping). That’s why when you’re in a bad mood and you stay in a bad mood for a long time, it disrupts your sleeping, your eating, and your hormones. Then the sadness and anger go to the pituitary gland. More hormonal, eating and sleeping changes occur. Then, finally, those chemical symptoms proceed via the brain stem to your adrenal gland, which broadcasts the emotions all over your body. Note: The Adrenal Gland produces hormones that are vital to life, such as cortisol which helps regulate metabolism and helps your body respond to stress, and aldosterone which helps control blood pressure. Second: When you feel frustrated or depressed, you r brain stem releases epinephrine, a neurotransmitter that makes you get wound up and irritable. Your adrenal gland also releases a stress hormone; cortisol, that makes you want to eat even more. Third: That stress hormone cortisol starts attacking your immune system. What was first frustration and anger now becomes a long-term depression. Body depression sets in with a cascade of irritating, sleep-inducing, and pain-causing cytokines. Cytokines promote inflammation everywhere in your body. Fourth: As a result of cytokines, your white blood cells release proteins that make you feel weak, tired, and achy. You feel like you have the flu or a fever. Fifth: Your cytokines eat up your mood neurotransmitters, making you feel even more depressed. Norepinephrine and serotonin, important to keep your mood elevated, start to drop, causing you to feel more depressed, more angry, more irritable. Sixth: Your depression and anger become more solidified in your body and organ systems, especially your heath, your blood pressure, and your blood sugar. Seventh: Changes in Norepinephrine and serotonin cause body aches and pain everywhere. You feel like you're dragging your body around. Eighth: You can’t fall sleep or stay asleep, and you cant stay awake during the day. Ninth: A viscous cycle of more health problems kick in either because you are putting on weight or you're losing weight, depending on your genes. Tenth: Your weight goes up and causes cholesterol to go up, increasing your risk of a heart disease and stroke even more. Eleventh: With increased weight, more insulin becomes a problem, and more blood pressure problems. This increase inflammation in the body and cholesterol floats in your blood vessels. Twelfth: Your memory get affected and you can’t remember people’s names. As this gets worse, you are at a higher risk of dementia, which causes you to get even more depressed. Conclusion: As you can see, emotional problems end up becoming physical, and even dangerous. Technically, depression is anger turned inwards. How do we tackle this? More love, more joy, more connections, more self-love, and a solid support system of family and friends, and so on.